In a recent interaction at a reputed MBA school, I was stunned to hear a student tell me, “The day I got my placement was the most depressing day of my life.” He further explained that he wasn’t looking forward to a life in cubicles and his heart was in starting out on his own venture. I asked him why he was taking the job instead of becoming an entrepreneur. ‘Student loans’, was the answer. Unfortunately, he isn’t the only one giving up crucial years of his life to a bank. It is common for older adults to take expensive home loans and then, in essence, give three of the most productive decades of their life to the bank to repay the loan. Student loan repayment schedules ensure that the individual has very little flexibility to take risks and try something innovative. The loss of human potential is borne not just by the individual who compromises on dreams, but also by society that depends on innovation to move forward. How can we reorient such an essential financial instrument so that we can offer young people the freedom to follow their hearts and talents instead of restricting them? The answer comes from an old idea by economist Milton Friedman: through the proposal of future income contracts, or Income Share Agreements (ISAs). An ISA is a contract that an investor enters into with borrowers whereby borrowers commit to pay a fixed percentage of their future income for a fixed number of years. Friedman thought this would only become feasible if we figure out how to come up with complex customised agreements and keep track of repayments. While the latter is no longer an issue due to computers, the former has received a big boost with the development of decision analysis. At Stanford University, Andrew Carver from the Decisions and Ethics Center wrote his 2004 dissertation, ‘Income Collateralised Loans’. Startups were tried using Carver’s idea, including the one I tried with three others. We had to stop at that time because the regulatory climate did not support ISAs. Thankfully, other people didn’t stop. Germany’s ‘Career Concept’ has been investing in education using ISAs for a while now, as their legal system allowed such contracts. In 2013, the state of Oregon in the US passed a bill to investigate a pay-itforward system where students would attend college tuition-free and then pay a percentage of their income forward to fund future students. As an ISA repayment involves paying a percentage of current income, the repayment automatically adjusts to the borrower’s current situation. Let’s assume an engineering student agrees to pay 10% of her income over the next 10 years — starting only after she graduates — to her investor, who has put in Rs 10 lakh. If she starts with an annual salary of Rs 6 lakh, she would owe Rs 60,000 the first year (as opposed to Rs 1 lakh in a traditional loan at 10% interest). As she starts getting raises, her repayments increase. For instance, if she ends up with an annual salary of Rs 25 lakh by Year 7, the investor will annually receive Rs 2.5 lakh. Now let’s say this engineer, in the middle of her career, gets laid off or wants to take a break. In those months, she will have no income at all. In a traditional loan with 10% interest, she will have to make a repayment of Rs 8,333 a month (Rs 1 lakh a year) even though she may not be in a position to make a repayment. In the ISA, she would owe nothing in the months she has very little or no income. This protection is the primary benefit to the borrower, where she does not face financial ruin when life takes a downturn. Second, she may get disgruntled with her mainstream career, and decide to become an entrepreneur. The ISA can include entrepreneurial clauses so she can take arisk and defer payments until she is more comfortable, or pay with stock. This would be of great value to the investor, as entrepreneurs can generate high returns when they finally break through. Even in a situation where the borrower remains in the same job, her career advancement would typically end up giving a higher return to the investor than a traditional loan. Conscientious ISAs would also have a repayment cap — for instance, no more repayment than three times the principal — to avoid exploitation. A financial institution disbursing ISAs will likely share the risk across many investors so that the exposure to a single investor is low. An ISA could be easily set up using decision analysis to be roughly equivalent to a traditional loan with much better benefits to both investor and borrower. I guess you’ve already mentioned that decision analysis would enable to creation of complex customized agreements. But take the pathological case where I borrow an amount of money against my future large income, then just deposit in a fixed deposit in the bank or invest it all in stock. Now, the income I get is just the dividend payments, of which I return 10% to the bank. How would an agreement safeguard against this without making use of a concept like minimum interest payments? Great question, Cohan! 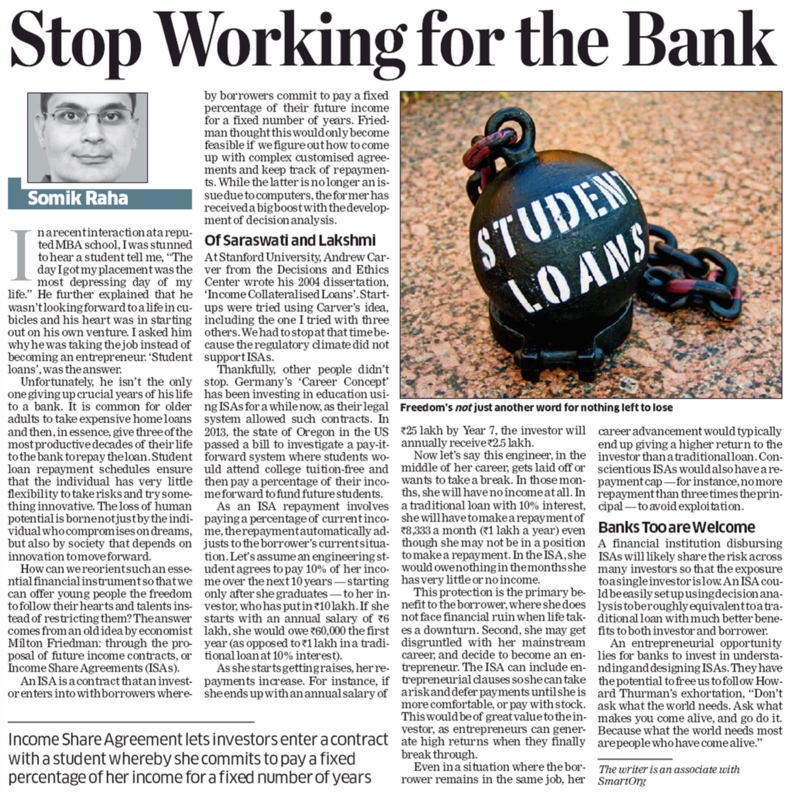 If the borrower is a student, this is easily mitigated by the investors paying tuition directly. Similarly, if someone wants to buy a home, the investor(s) would directly perform the purchase so the money is used for its intended purpose. When we were making our business plan around ISAs, pretty early on, we realized that this is about community-building, and that investors would be brought together with borrowers so that borrowers understand they are taking resources from other human beings, not some abstract entity. If the feeling of gratitude can be sparked, as opposed to a sense of entitlement, the system will sustain. It wouldn’t be unthinkable to offer lower repayment options provided borrowers become investors themselves in the next cohort. 1. The repayments are linked to & varies according to the Income of the borrower. 2. The deductions are automatically linked to the ATO (Australian Taxation Office). 3. Income thresh holds for repayments In 2014-15, are NIL for earnings below $ 53,345 starting at 4% to get capped at 8% for earning above $ 99,070.
a. Deductions can be linked to PAYG (Pay As You Go) which is the Tax Deducted at Source.If a person knows how much the annual earnings are going to be, then he/she can inform her employer to deduct extra towards the estimated amount need to be repaid. This deduction will be a part of the PAYG deductions made every month. In that sense, the monthly repayments can be fixed. a. The tie for the information flow will be between the University, HELP & the ATO. b. This system is fluid. What is fixed is the amount of dues to be paid. c. The IT Returns will reflect the amounts due towards Income Tax and the HELP debt calculations reflected separately in the schedules to the returns. The repayment method can be worked out with the ATO. They are a phone call away and are quite honest & accommodating in my experience. This is a significant development in the US. The post is a good read.